With multiple projects in, hand he has been producing sensible films in his career. Years passed by and the director is now busy with Ae Dil Hai Mushkil in which Ranbir Kapoor, Aishwarya Rai Bachchan and Anushka Sharma in the lead roles. The movie is said to be a romantic entertainer. It was Siddarth Malhotra who has been on success track. All his recent movies ended up super hits, and the actor has been busy with many films in his hand. He teamed up with Alia Bhatt in the past for his debut movie Student of the Year and after years, the duo teamed up again for the film. Pakistani actor Fawad Khan made his debut in Bollywood with Khoobsurat, and his performance has been widely praised across the country. He has taken his time and signed the flick as one of the lead roles. Top actor Rishi Kapoor has been signed to play a crucial and entertaining role in the movie. Rajat Kapoor and Ratna Pathak played the other prominent roles in the film. It has been made on a budget of Rs 25 crores and is said to be an emotional family entertainer. The trailer raised the expectations on the film and was released on March 18th between enormous expectations. The film collected exceptional figures across the world, and the movie has been declared as a blockbuster all over. Made on a decent budget, the film recovered the investments in its first week. 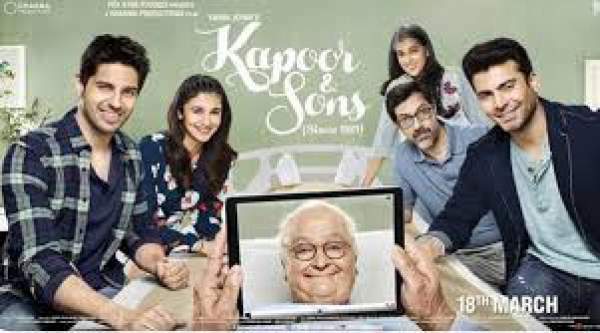 Kapoor & Sons collected Rs 65.07 crores in two weeks of its boxoffice run. Despite of many releases this week, the movie managed to be strong all over and the movie collected Rs 67.88 crores in 17 days of its box-office run. Karan Johar produced the film on Dharma Productions banner. The performances by the lead actors along with the emotional content and a heart touching climax are the major highlights of the movie.